The Warren Township Historical Society was organized in 1975 to unite all people interested in the area history of Warren Township, Lake County, Illinois. Members strive to learn about the history of the area, collect artifacts pertaining to the past, and preserve those artifacts for the future. The building that houses the Warren Township Historical Society is the oldest structure in Warren Township, built in 1841 as an inn, and one of the oldest structures in Lake County. The two-story frame house was built in 1844 as a stage coach stop and acted as the town hall of the area, serving as voting place, post office and dance hall. Rooms on display in the house include a 1930s kitchen and a 1900 bedroom. Displays in the interior of the Mother Rudd House include historic photographs of Gurnee. Artifacts from the Gurnee and Warren area are displayed in two rooms of the house. The recently re-mortared barn foundation behind the house is believed to have been a station of the Underground Railroad. Through a donation by Sears, plaques within the barn foundation¹s garden tell the story of the underground railroad. 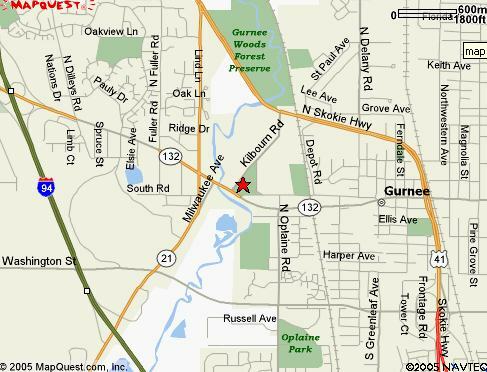 The Village of Gurnee's historical info on the Mother Rudd Home. "The Underground Railroad in Illinois" by Glennette Tilley Turner. The U.S. National Park Service's "About the Underground Railroad" pages. "Illinois Trails" transcription of a 1901 history of the Underground Railroad (using 1901 terminology). The Mother Rudd House is located at 4690 Old Grand Avenue in Gurnee. Access is off of Kilbourn Road, north of Grand Avenue (Illinois Highway 132). From the Tri-State Tollway (I-94): Exit Grand Avenue (Illinois Highway 132), eastbound. Continue past Six Flags Great America to Kilbourn Road, and turn left. From US-41 northbound: Exit Grand Avenue (Illinois Highway 132), turn left (west) onto Grand. Kilbourn Road is approximately one mile west of US-41. From US-41 southbound: Turn right onto Kilbourn Road (approximately 3/4 mile past Illinois Highway 21). Follow Kilbourn about 1/2 mile to Old Grand. Museum open to public at scheduled Open Houses. Research by appointment. School groups, scout troops, etc., can be accommodated by appointment; please call or email. Membership is open to all. Members receive our bi-monthly newsletter. Dues are $10 (individual), $15 (family), $30 (contributor), $50 (patron) per year. Seniors (65+)/Students $7. We are looking for members to work on displays, work on the newsletter, do accessioning or clean the house. If you think you don't have any experience, we will teach you. Our workers have learned by doing. You may have an idea we can use. Come teach us.